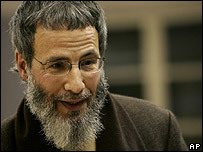 Yusuf Islam will release an album of new songs this year, 28 years after he left the music industry. As folk musician Cat Stevens he had a string of hits in the 1960s and 1970s, including such contemporary classics as Moon Shadow and Morning Has Broken. He gave up music in 1979, two years after he converted to Islam and changed his name. The new album, which has yet to be given a title, will be released by Polydor records in the autumn. The singer says he hopes the album will improve understanding between Islam and the West. "It is important for me to be able to help bridge the cultural gaps others are sometimes frightened to cross." Islam has been a teacher and an advocate for his religion for many years, and founded a Muslim school in London in 1983. In 2004, he was refused entry to the US on "national security grounds". However the singer said he had "consistently denounced the acts of terrorists as being directly contradictory to the peaceful teachings of Islam". At around the same time as he was refused entry to the US, Islam was presented with the Man for Peace award by a group of Nobel Peace Laureates. In recent years, the singer has returned to the recording studio. A re-recorded version of his song Peace Train was released in opposition to the Iraq War, and Islam duetted with Ronan Keating on a cover of Father and Son. He has also released several albums of religious music and spoken word on his Mountain of Light record label. The new album will feature completed versions of songs that Islam started more than twenty years ago. They were recorded with the help of producer Rick Nowels, who is known for his work with Madonna, Stevie Nicks and Belinda Carlisle.